February - May we will be participating in a group project every Tuesday evening. Join us to practice your metal arts skills! Not just for women, novice dudes can come along as well! Pre-requisite - beginner welding class or equivalent experience. Wear appropriate clothing if planning to weld or grind. 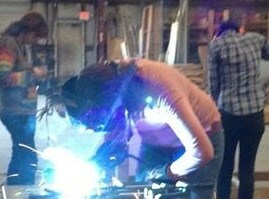 Join us to be inspired, further your project, or participate in a group project with other welding women! Novice dudes can come along as well! Join us to kick off our spring Art Vehicle build! More than an Art Car, this vehicle will be BurningMan- and Glow-worthy! Come hear of the theme and share your ideas. Then join the build to learn new skills, share your talents and have fun with the creation. This gathering is free, registration required. We'll let you know the location ASAP.